Bishop Emeritus Willie Walsh was born on the 16th January 1935 in the parish of Roscrea Co. Tipperary. The youngest of six children, he attended Corville and Roscrea National schools and received his Secondary School education at St. Flannan’s College in Ennis. He studied for the priesthood at St. Patrick’s College, Maynooth and the Pontifical Irish College in Rome. He was ordained to the priesthood in the Basilica of St. John Lateran in Rome on the 21st February 1959 by Cardinal Luigi Traglia (who would later go on to become Dean of the Sacred College of Cardinals). After ordination Bishop Walsh returned to the Pontifical Lateran University in Rome for further studies where he was awarded a Doctorate in Canon Law. On his return to Ireland he was appointed to the staff of Coláiste Éinde in Galway while studying for the Higher Diploma in Education at University College Galway. He was appointed to the staff of St. Flannan’s College in Ennis in 1963 and taught Maths, Science, Physics and Religion for 25 years until his appointment as curate at the Cathedral in Ennis in 1988. In 1990 he was appointed as Administrator of the Cathedral and held that position until he was appointed as Coadjutor Bishop of the Diocese on the 21st June 1994. He succeeded to the Diocese following the unexpected death of Bishop Michael A Harty in August 1994. He was ordained Bishop at the Cathedral in Ennis on the 2nd October 1994. 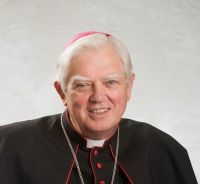 He served as Bishop of the Diocese for sixteen years. He submitted his resignation to Pope Benedict XVI on reaching his 75th birthday in January 2010. He remained as Bishop of Killaloe until the appointment of Bishop Kieran O’Reilly on 16th May 2011. Bishop Walsh was one of the founder members of the Catholic Marriage Advisory Council, (later to become ACCORD) in the Diocese of Killaloe. During his time as Bishop he worked tirelessly to promote reconciliation and healing. He gained world- wide attention for his Pilgrimage of Reconciliation during Advent 1999 when he undertook to walk across the Diocese from Loop Head to Kinnity as a sign of solidarity and repentance to all who had been hurt. He has had a life-long passion for the sport and in particular hurling. He has been involved in coaching hurling teams at club, college and county grades. He now lives in retirement in the parish of Ennis and can be contacted through the Diocesan office at Westbourne. Bishop Walsh’s Coat of arms consists of on the left hand side, the ancient arms of the Diocese of Killaloe, and on the right, the personal coat of arms chosen by the bishop himself. The personal dimension of Bishop Walsh’s Coat of Arms represents his origins and ministry. The cross is taken from an early Christian stone found in the Roscrea parish and the boat is taken from the coat of arms of the town of Ennis where Bishop Walsh spent most of his priestly life before becoming Bishop. 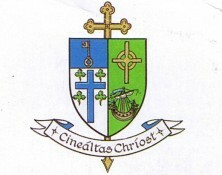 Bishop Walsh’s motto is Cineáltas Chríost – The Gentleness of Christ which reflected his hopes for his ministry as Bishop.